DayPilot Scheduler widget displays a time line for multiple resources. Supports AJAX and HTML5. Automatic and manual localization. Full CSS styling support. 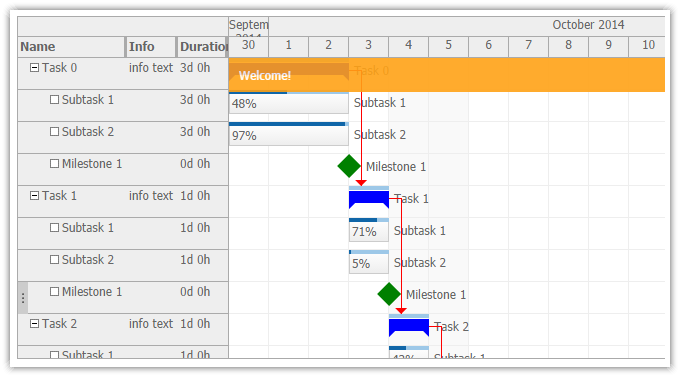 DayPilot Gantt chart displays a timeline for a hierarchy of tasks (one task per row). DayPilot Calendar widget displays a daily and weekly event calendar. Supports AJAX and HTML5. Automatic and manual localization. Full CSS styling support. DayPilot Month widget displays a monthly event calendar. Supports AJAX and HTML5. Automatic and manual localization. Full CSS styling support. DayPilot Kanban control displays tasks arranged by state in columns.